The MORryde UO12-029 SRE/4000 Heavy Duty Shackle Kit is an excellent upgrade for your running gear to prevent wear and tear. The heavy-duty kit includes 1/2" shackle brackets, bronze bushings, greaseable or wet bolts, and nuts. The 1/2" shackle bracket is built stronger and more durable not allowing the bracket to stretch or elongate while in use. The bronze bushings and wet bolts provide periodic lubrication that will greatly extend the product life. Will fit units with upgraded suspension systems. This Heavy Duty Shackle Kit is designed to be used on any tandem axle trailer that features the MORryde SRE 4000 or CRE3000 suspension system. For hangers with a correct track system. For use with SRE4000 and CRE3000 & stock or equaflex w/ 2 1/4" shackles. 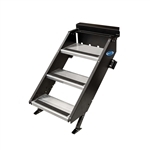 MORryde CTG60-4290W Sliding Cargo Tray - 42" x 90" MORryde STP-3-27-05H StepAbove 3-Step RV Entry Steps - 26" to 28" Door Width MORryde CTG60-2960W Sliding Cargo Tray - 29" x 60" MORryde CTG60-2048W Sliding Cargo Tray - 20" x 48"
MORryde UO21-003 X Factor Performance Cross Member - (SRE, CRE And Other Equalizers) MORryde CTG60-2090W Sliding Cargo Tray - 20" x 90"